Crispy, flaky puff pastry wrapped around a tasty chickpea and mushroom filling, what's not to love? 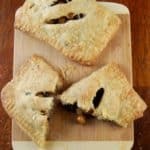 Try my delicious vegan Chickpea Mushroom Turnovers. 1 sheet whole wheat puff pastry. See recipe notes below for the recipe. You can also just use storebought puff pastry. Thaw the puff pastry until it reaches room temperature. In a saucepan, heat the oil and add mustard seeds. When they crackle, add the onion. Saute the onions until they start to brown. Add the garlic and ginger powder, garam masala and red pepper flakes. Stir to mix, then add the mushrooms with a pinch of salt. Once the mushrooms are cooked and have expressed all their water, add the chickpeas and lemon juice and coriander leaves. Stir to mix and let the mixture dry out completely. Turn off the heat and set aside to cool. Roll out the puff pastry into a slightly larger rectangle and, with a pastry cutter, divide it into six pieces. Roll out each piece into a 6 by 3 inch rectangle. Divide the chickpea-mushroom filling into six and place each portion on one half of each rectangle, leaving a 1/2-inch border. Brush the edges with some water and turn over the other half of the puff pastry over the filling. Press down on the border to seal, and crimp the edges with the tines of a fork for a decorative look. Place the pastries on a baking sheet. Make a couple of slits on the top of each turnover with a knife or a pizza cutter. Preheat the oven to 425 degrees. Bake the turnovers for 25 minutes until they are golden. Remove to a rack and let them cool for a few minutes before serving. To make whole wheat puff pastry, follow this recipe. Substitute half the all-purpose flour with whole wheat flour.